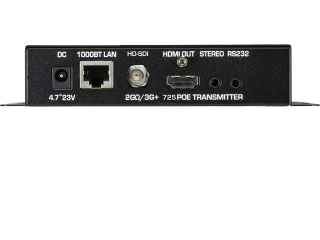 The What: Just Add Power (J+P), which specializes in Ultra HD over IP, will unveil the 725POE 2GΩ/3G+ SDI Power over Ethernet (PoE) transmitter at InfoComm 2018 booth N464. The What Else: Features include stereo output with audio delay, local HDMI loop-out, null-modem-integrated RS-232, and HDMI pass-through. As with all models in the J+P lineup, it integrates seamlessly with any generation of the company's products. This allows integrators to select the J+P solution that best fits the job, providing an evolutionary, scalable, systems-approach to 4K video signal distribution requirements. The Bottom Line: The new J+P 725POE 2GΩ/3G+ SDI PoE transmitter provides SD-/HD-/3G-SDI format support to Just Add Power's 3G HD over IP system. Eliminating the need for an SDI-HDMI converter in the IP video distribution chain, integrators have the flexibility to add an SDI source to their 4K infrastructure.